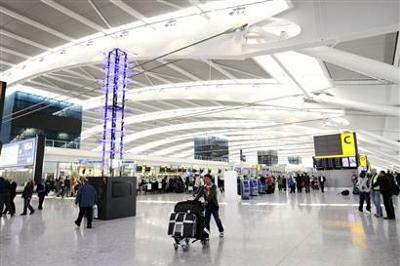 Heathrow Airport, in London, is tremendously vast. It is consists of four separate terminals. Each of which have various duty-free shops, restaurants, airline representatives and so on. I did not have much time to make any mistakes, so I was carefully looking at all every signs and boards. Fortunately, there was no need to change the terminal. Air Canada was in the same building that I entered. Heathrow airport was is really elegant and it was a little strange for me. All the shops were decorated with heart shaped chocolates, boxes tied with red ribbon; fancy mannequins wearing tailored clothes etc. I really wanted to stop to window-shop but time was flying and I had to find my Gate. More interestingly, cars and buses were in on the left side of the roads and drivers were on the right. That gave me a strange and interesting feeling. Eventually, I reached the counter that gave gate numbers. A busy blond lady told me: “Run! Run! You have just ten minutes left!” Hearing that, I ran immediately. However, I was relatively sure that the plane would stay for me since I had my boarding card. Running with a heavy back-pack and two bags in hand, was exhausting and annoying. My back was aching and my hands were red because of holding too so much weight. Despite all that, I was running as fast as I could. In some areas, I took escalators to be faster. I did not know that some small cars inside the building took special people to the gate and I could have asked them to help me as well. My feet were weak and I could not stand on them. I was thirsty and hungry. My stomach was singing a song like a frog in swamp: I am hungry! Hungry! Hungry! Finally,Lastly I found the gate. I could not see anyone in front of the gate. I was the last person to board. A kind old lady asked me: “Where have you been? We have been waiting for you for so long". I told her, “I am so sorry. My previous flight was delayed and I arrived right just now,”. She looked at me seriously and then said, “OK, You can go that way,” and pointed to gate number six. Finally, the last person boarded on the Canadian Airplane. A tall slim smiley flight-attendant, stood by the door of the plane and welcomed me and I found my seat near a window. Wow Nafis!! This story is getting better and better as you tell it. :) Your writing is improving as well. Great work. Remember to re-write your story below as a comment to learn from your mistakes ok. I look forward to part 3!